Dein is a newbie to this blog, but her music is no stranger to my ears. 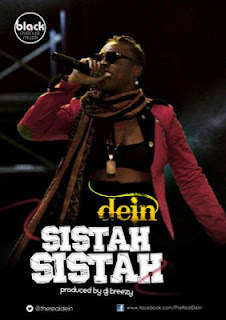 Currently located in Ghana, Dein released her first two official singles "Happiness" featuring D-Black and Aj Omo Alajah and "Juju", which was later on followed by the "Clique Remix" by BAM, featuring herself, D-Black and label mate - Joey B. After a few other releases - Dein performed alongside big Ghanaian acts on the biggest music stages in Ghana, including sharing the stage with American International artist Chris Brown. Dein is back with a brand new freestyle single which we saw the release of on Friday entitled "Sistah Sistah", produced by DJ Breezy. The "Happiness" star shows her versatility on this song where she sings instead of rapping. Listen to the new Afrobeat banger "Sistah Sistah" below.